This entry was posted in Uncategorized and tagged Animal photos, cows., humor, humour, kiss, Life, Photography, Postaday by Multifarious meanderings. Bookmark the permalink. 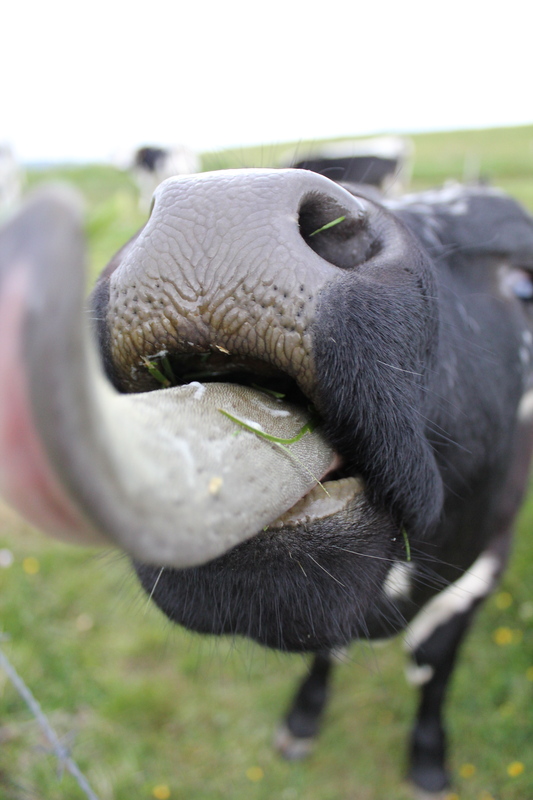 I’m married to a cattle rancher: I’ve seen a few cow “kiss” attempts. They’re awesome. Oh this is TOO cute! What’s her name? I’ll tell her the next time I go there, although I fear she’s been turned into lasagne since…. hehe i love this pic! She’s a superstar cow now, she’ll need a pair of Raybans and a pen to sign autographs…. Glad it made you smile! Hilarious…. I love it! (And I love cows too). Cows are such gentle creatures. I’ve never met one with a mean bone in their body. I totally agree. Horses, on the other hand, are mental cases with teeth. It’s no wonder they ended up in the food chain. Yep, I have to agree. I used to have a veterinary colleague who called all horses “dinosaurs.” He said if it weren’t for people, they would be extinct. I sort of have to agree with him there! I kind of want a piece of that kiss. Great, happy, squishy photo! A pretty great photo I say … Splendid!!! What a great pic! Made me laugh out loud! Glad it made you laugh, wherever you are… isn’t blogging great? Yes it is! Have a great weekend. Great shot!! I think my nose is wet! I hope it was not the best kiss you ever got!! Great pic. Reminds me of the cow on our neighbors dairy farm growing up.